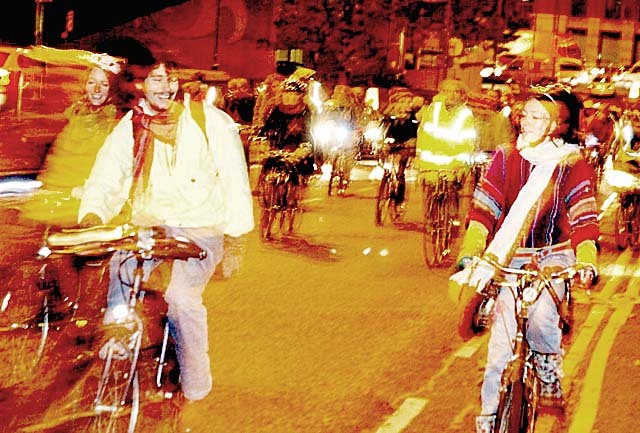 [PrintView] Nottingham's Critical Mass Bike Ride has new people with new energies. The 'last Friday in the month' ride gathers in the Old Market Square at 5pm. Critical Mass for everyone who rides a bike in Nottingham and wants to take part - join the discussion group at http://lists.riseup.net/www/info/nottcriticalmass. The ride lasts no more than a couple of hours (depending on the weather! 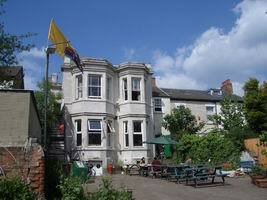 ), ending in a conveniently placed pub or the Sumac Bar for a few drinks. You might like to check out rides and other bike activities with Pedals, 'The Power Behind Nottingham's Cyclists'. There may be a A chance for all cyclists to gather in the warmth face to face on the last Friday before the last Friday! On Tuesday 15th Feb 05 there was an Anti-war Anti-g8 Critical Mass in Nottingham. Around 30 cyclists gathered at about 3pm in Nottingham for a critical mass ride with the theme of 'no more blood for oil' and 'no G8 2005'. We set off towards the city centre and went round and round a key roundabout in the city centre until we became victims of our own sucess, ie we couldn't move because the roundabout was backed up with stationary traffic! We then set off through the centre of Nottingham and down to another key roundabout with chants of 'no more blood for oil' and 'get out your car and on your bike'. The drivers must have supported us because they were all beeping like mad at us. One or two suv drivers seemed particularly inconvenienced, especially when they tried to pass us by mounting the pavement which they suddenly found to be blocked by bikes. We cycled round for around two hours and fun was had by all. As reported on Indymedia at http://www.indymedia.org.uk/en/2005/02/305382.html, where more photos can be viewed ... Also at Tash's FotoBlog. .get on yer bike for the Capitals Biggest Mass Ever on Friday the 28th. Meet up point is on the South Bank, under Waterloo Bridge at 6pm. There is no set route and anyone is free to join - as long as youre on unpowered wheels. See www.criticalmasslondon.org.uk for a copy of the Met's hate mail to CM and the Masses response to it. These rides have been taking place in London for 11 years with no trouble, so this sudden intolerance can only be seen as further erosion of our freedom of movement. A Senior Tory councillor has declared that he parks his car in a bike lane every morning. Nottingham Evening Post Report : 19 May 2005. Drop him a line or, if he wants to park in our bike lane, why not cycle around his road? 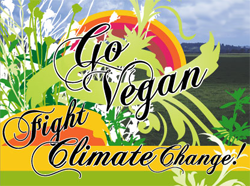 Note: Maps are based on postcodes which can cover a wide area, especially for rural locations. -admin- ... hitcount from www.digits.com: - thanks for helping us to a quarter million hits!